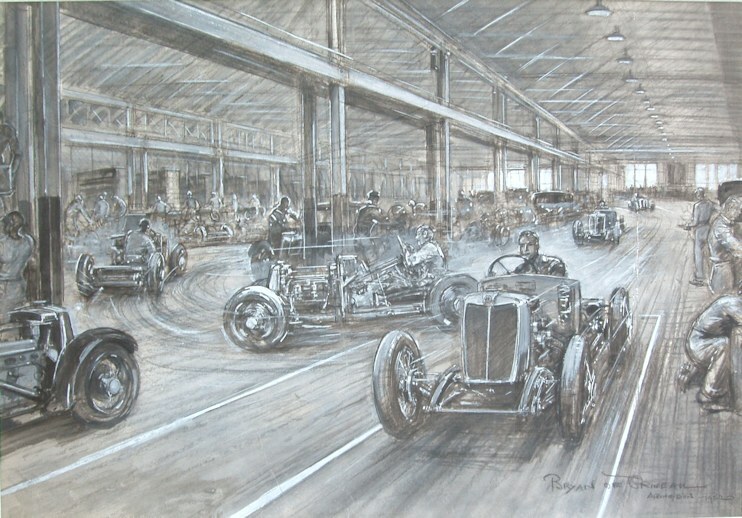 Bryan de Grineau is the UK motoring artist who always seems to be less appreciated and undervalued compared to his contemporary rival, Gordon Crosby. Readers will recall that Crosby worked for The Autocar and de Grineau for The Motor. Bryan de Grineau was born Charles William Grineau on the 11th May 1883 and was the son of a well known illustrator and caricaturist Charles Grineau (1852 – 1899). who used the pseudonym Alfred Bryan. Alfred Bryan was quite successful in his time and worked for popular magazines such as The Hornet, Judy and Moonshine and there are collections of his work at The National Portrait Gallery and Brighton Art Gallery. It is believed that Bryan de Grineau studied under his father and did not receive any formal art training. 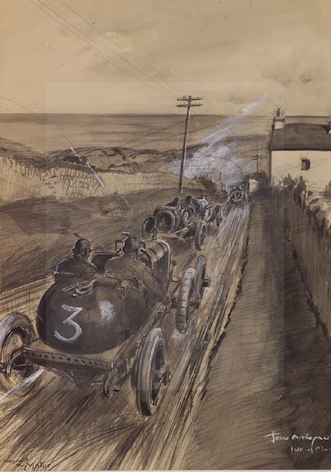 In an article he wrote in The Motor (22nd October 1935) entitled ‘Motor Racing As An Artist Sees It’ he said his first commission for The Motor was at the French Grand Prix at Dieppe in 1908. This would make him around 25 years old, so he must have had other prior employment, unless he was just working for his father. (Crosby was born in 1885 and started to work for The Autocar around 1908, previously working in Daimler’s drawing office). The early pen and ink art of de Grineau is very similar in appearance to that of his father with an emphasis on very ‘busy’ line work no doubt in part influenced by the printing processes of the time. Most magazine illustrators had graduated from line engraving and wood block technique. (Crosby came from a drawing office background with more emphasis on clear line work). A good example of de Grineau’s early art is this illustration entitled ‘The Guards Trip to Hastings’ in1909. This was an early Army exercise in determining the practicality of the car for military use. The early work was done under the name John (rarely Johnny) Bryan and it was not until around 1918 that he started to use the name Bryan de Grineau. It would seem that the reasons for the name change were commercial, to sound more important and be easier to remember. It is said by some authors that this was at it wife’s suggestion. Interesting to note that there was a transition where he signed his name in various ways during the First World War so possibly the name was not a sudden change. Anyhow in later work all his art was signed Bryan de Grineau. Signatures seen over his lifetime are John A Bryan, John Bryan, Johnny Bryan, John de Bryan, Charles W de Grineau, Charles de Grineau, John de G Bryan, Bryan de Grineau, Capt Bryan de Grineau and initials B de G. It would seem that in the early days de Grineau was probably a staff artist at Temple Press, the owners of The Motor. He was probably paid a fixed weekly salary where he would produce whatever was required for that week’s issue. This would consist of technical drawings, illustrations for articles and cartoons plus the more familiar race report illustrations. 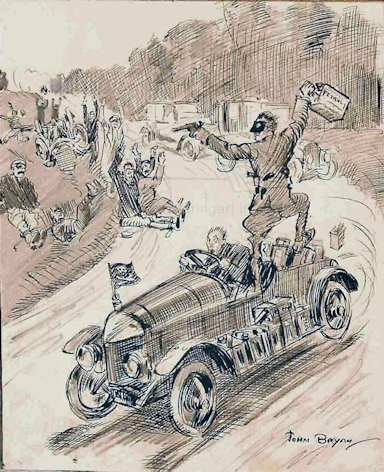 A good example of his infill work is the February 1914 cartoon for The Motor of the ‘Modern Day Highwayman’. The cartoon expanded a news item about a man in Southern England who had hired a car then gone out holding up other motorists with a revolver to obtain his supplies of petrol. This art is obviously a very quick sketch no doubt requested by the editor at the last minute to fill a blank space in the copy. 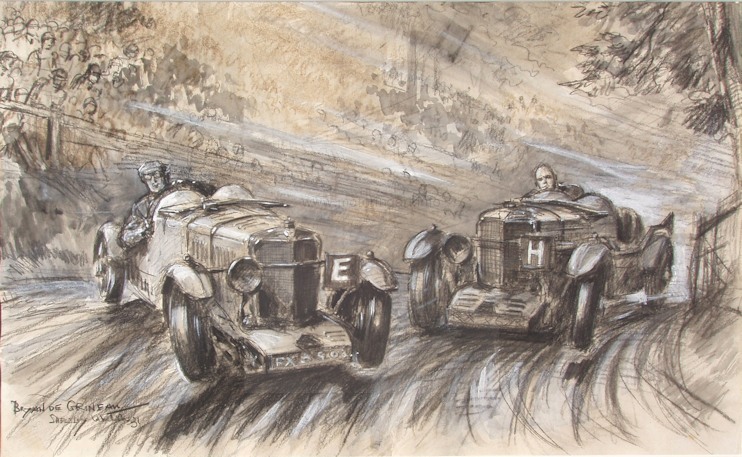 His motoring illustrations of the time were in various media such as pencil, pen and ink, charcoal or watercolour shades of grey or sepia wash often enhanced with white gouache but charcoal was his principal medium. I have not seen any pre-First War art in full colour. 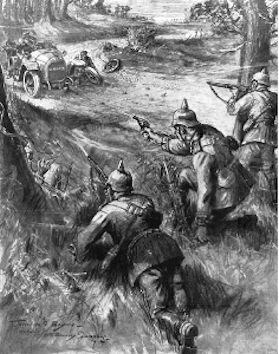 Like so many young men of the time, de Grineau must have signed up to fight in the First War and it was from there that he sent back some superb drawings of the fighting to the Illustrated London News (ILN). He rose to the rank of Captain in the Royal Artillery. Whether he was also contributing to ILN at the same time as working for The Motor before the war is unlikely, particularly if he was Temple Press salaried. However, the link with the ILN was eventually to result in the loss of de Grineau’s services to The Motor. I would suspect that on returning to the UK after the war his contract with Temple Press was on different terms, either freelance or staff but allowing him to do work for other employers. We start to see work for postcards, posters, race programmes, car manufacturers’ advertising and sales brochures. He continued working for The Motor up to 1936 before gaining his living elsewhere, with ILN being his principal employer. It was perhaps his schedule of work with The Motor that allowed these extra commissions. 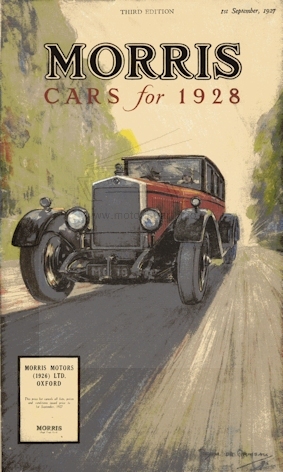 This had a great influence on the quality of his motoring art and possibly results in a poor comparison with the work of Crosby. The Motor went to press on a Sunday evening so that the magazine could be printed on the Monday and be on sale on the Tuesday. The schedule was extremely tight for Saturday races in the UK and even tighter for Sunday racing on the Continent. 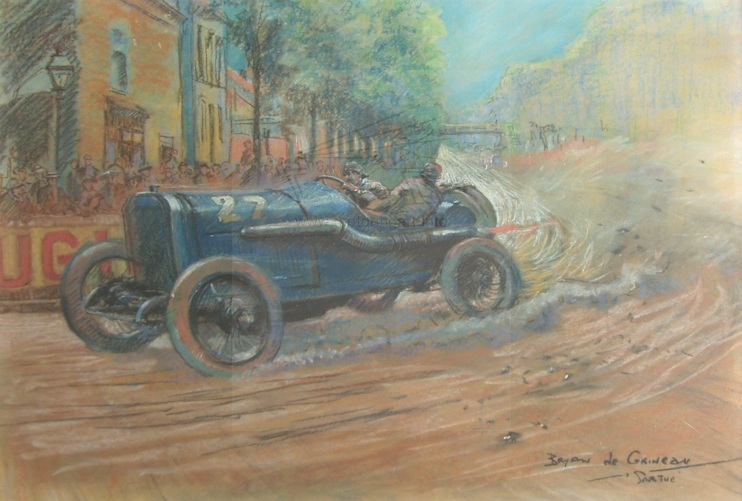 De Grineau had to do drawings in the back of the pits whilst the race was in progress or in the 1930’s onboard an aircraft returning from a Continental event. De Grineau did not have time to work-up and finish his drawings in comparison to Crosby who had three extra days as The Autocar was not published until the Friday. Hence speed of drawing was the essence with very little chance to go back and make alterations. It is interesting that I have not seen any de Grineau oil paintings and this is probably indicative of his mind set in the way he worked at speed. Using oil medium would probably be too slow, in his opinion, even when he had time to fully work-up a painting. 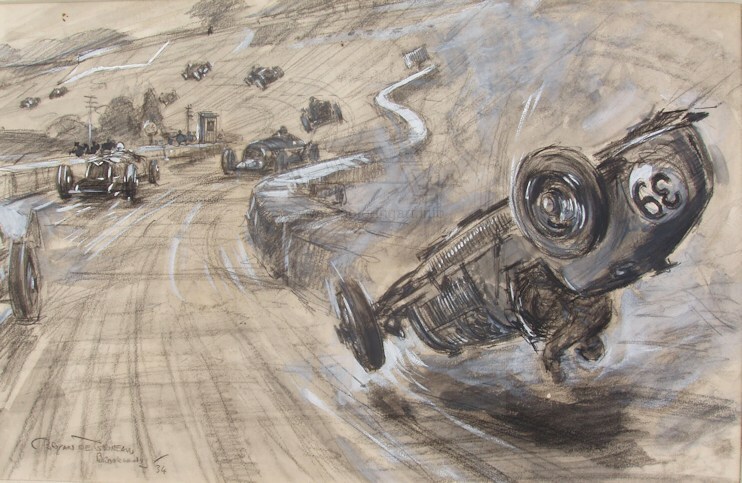 Another difference between de Grineau’s and Crosby’s work is that de Grineau illustrated far more spectacular crashes with cars and drivers flying through the air. However, this is probably more down to Editorial policy rather than artist’s choice. 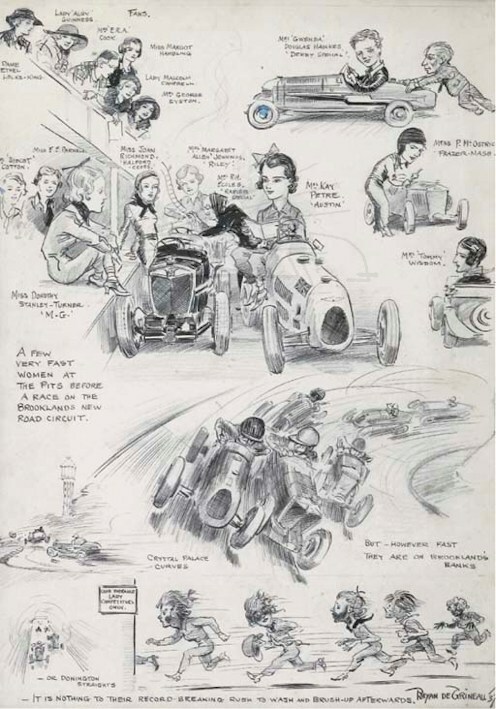 His work for The Motor post-First War continued to improve and it would seem he was retained principally for the race and motor show work, increasingly leaving the story illustrations, technical drawings and cartoons to other artists. It is clear that where he had time to fully work-up the art the output is every bit as good as Crosby. 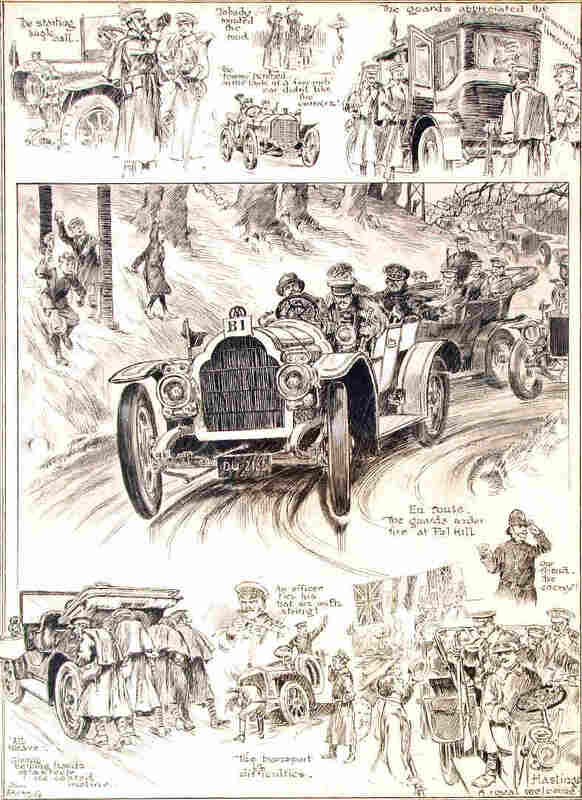 One area where his work was superior to Crosby was the composite illustrated pages taking the story of a race or Motor Show. In this art the portrait/caricature skills learned in his father’s studio are used to good effect. It is also during this period that we start to see examples of de Grineau’s colour work. The early examples seen by the author are watercolours where a relatively subtle colour wash (less bold than Crosby) is used. The main strength of the artwork is the background pen or charcoal artwork with the fairly pure colour applied over the surface. 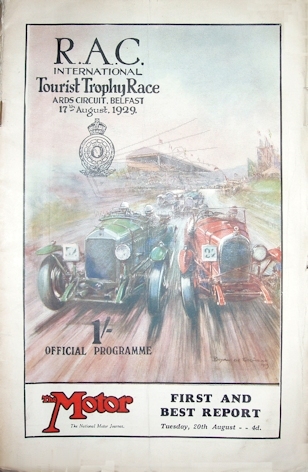 Good examples of his colour work can be seen on race programme covers. Some of his better, stronger paintings were a series commissioned pre-Second War by ‘Johnny’ Lurani of his racing exploits. Several of these were sold by Christies in 1990 at their Monaco sale. 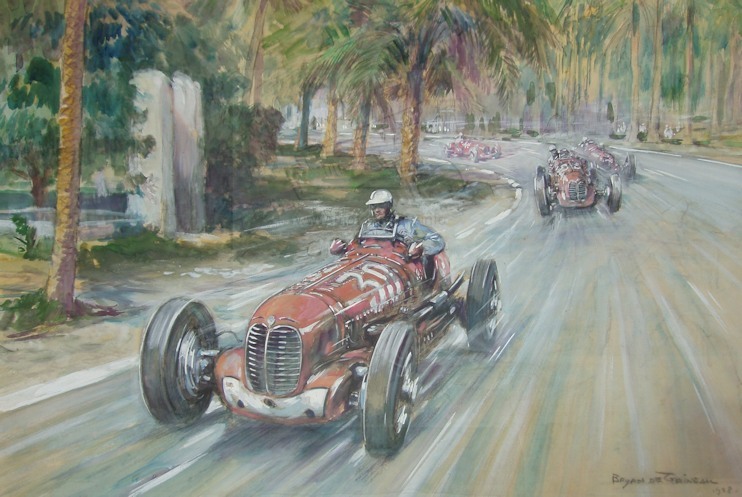 These paintings were also reproduced in Lurani’s book ‘Racing Round The World’. It can be seen that over his career, confidence in colour increased and some of his later posters particularly for the railway companies are extremely bold with colour taking complete precedence over the line work. In 1936 it is recorded that de Grineau left The Motor on the grounds that ILN paid far higher rates. Whether this was a straight transfer or if he worked for Modern Wonder in 1937-38 as an interim is not known. There is a period where de Grineau illustrated this weekly youth’s magazine which dealt with mechanical and science inventions both of the present time and of the future. This was a comic type magazine that was full of illustrations so his output each week must have been pretty intense. However, his principal employment up to the Second War was with the ILN and during the War he again enlisted. He was a War Artist producing war effort publicity material, posters and illustrations. 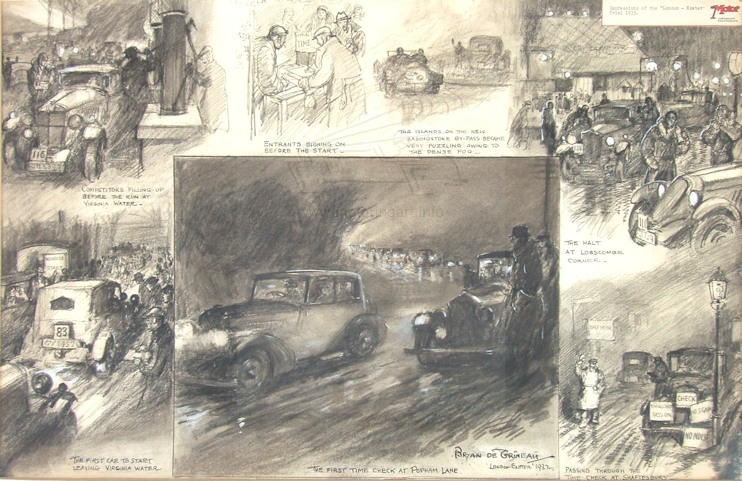 After the war he returned to employment with ILN illustrating more or less up to his death in May 1957. Perhaps his finest works during this period were the large number of illustrations completed for ILN readers of the Festival of Britain in 1951 and the Coronation in 1953. His obituary was published in The Times on the 21st May 1957. Subsequently an artist colleague wrote to the paper a couple of days later to expand the obituary. It was observed that ‘The exigencies of the press, however demanded speed in his finished drawings too. From my memories of working with him I can testify to the extraordinary feats of concentration he performed in turning a few hurried notes into a complete and detailed picture to fill two whole pages in a matter of hours. The picture literally sprang to life as his charcoal moved with swift, nervous strokes over the paper. Such speed and accuracy sprang from a foundation of fine draughtsmanship and brilliant technique’. So who was the better artist? Are auction prices a measure? If current prices paid by motoring enthusiasts are a guide then Crosby must be the winner. But is this due to a higher profile? Crosby had considerably more assistance in being recognised from The Autocar who generated a lot more publicity about their staff artist in comparison with what The Motor did for de Grineau. 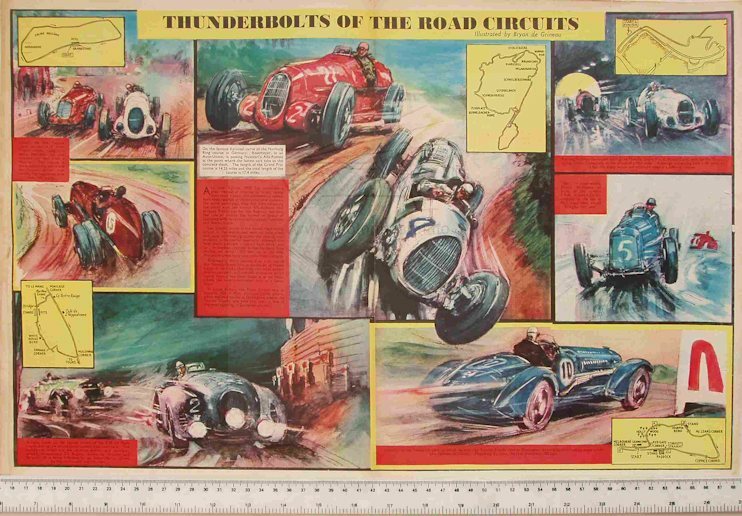 For example there are many more full page features and colour supplement’s of Crosby’s art and they produced after his death the two colour booklets of his paintings - ‘Meteors of Road and Track’ and ‘The Endless Quest for Speed’ . The aura around Crosby’s work has also been considerably enhanced by Peter Garnier’s excellent book – ‘The Art of Gordon Crosby’ published by Hamlyn in 1978. There is no book written about the art of de Grineau. Another factor is that the survival rate of works by Crosby is far higher than de Grineau. The regular appearance of art in auction fetching high prices has helped sustain the interest. This is particularly true of fully worked up paintings in colour, either watercolour or oils, as it is the colour work which is the most eye-catching. The value of an artist’s work is always difficult to assess and again does not always reflect the talent. The subject matter greatly influences the price, motor racing being the most keenly sought. Overall prices for de Grineau’s work are probably a half or less than the realisations of an equivalent Crosby piece. I personally prefer the majority of Crosby’s art, particularly his colour work, also I think his cartoon and humour work is superior. I believe that his racing scenes have a little more drama and action. On the other hand, I really appreciate de Grineau’s pages of composite illustrations which are far more fun and have more interest than those of Crosby. Of the figure work that is often quoted as the distinguishing test between the two artists I can see very little difference. Both artists were competent but some of the people illustrated are static and lacking fluidity. It is known that Crosby attended life classes in an attempt to approve his figure drawing. De Grineau’s figure work was good in the early days but in the 20’s and 30’s the standard seemed to slip however by the 1950’s I would say that his art was very proficient. It is unfortunate that with Crosby’s early death in 1943 we are unable to see how his work would have developed in later life. It is said that ‘art is very much in the eye of the beholder’ and I am sure that readers will have different opinions about who was the better artist. 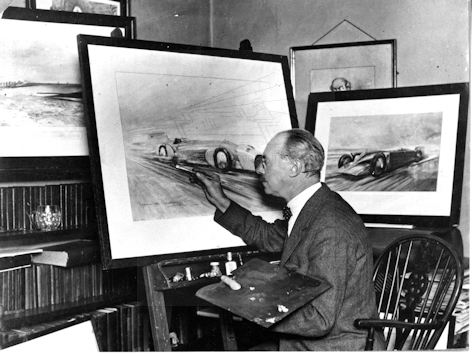 We are just so fortunate that in this period we had two very talented artists recording early motoring and motor racing. Somewhat as a postscript, in 2010 four drawings apparently by De Grineau were discovered. All are them are sanguine pastel on cartridge paper. They do not appear to have been published as there are no printing instructions and the drawings had not been fixed. 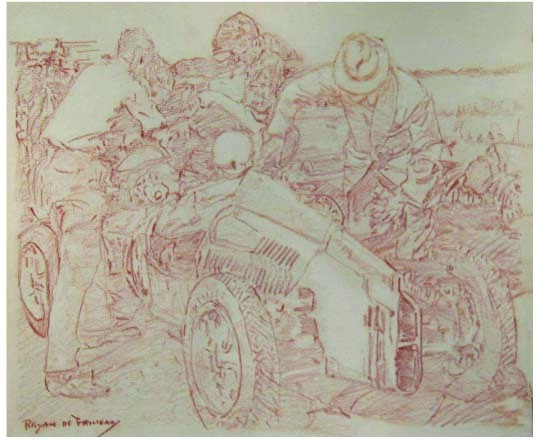 Three of them featured sketches from the early 1950’s whilst one was a retrospective sketch of Campbell’s Bluebird at Daytona. (Similar to a known De Grineau watercolour painting) De Grineau died in 1957 and it would seem these are sketches from his latter years done for his own amusement. Previously I had not seen any production motoring work after the time he worked for Modern Wonder in the late 1930’s. The most interesting picture is a Cooper 500 car in a pits scene. This picture highlights the changes in racing cars during his career from the early monster cars of the 1900’s to the lightweight rear-engined cars that developed post-war. This picture highlights the changes in racing cars during his career from the early monster cars of the 1900s to the lightweight rear-engined cars that developed postwar.